Contact me for lessons at the colleges, my studio, or online. I welcome your inquiries and will reply to all of them. 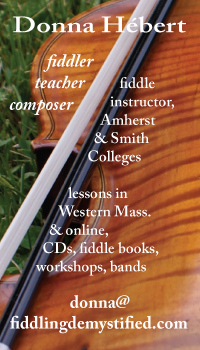 I teach fiddle and performance at Smith and Amherst Colleges in western Massachusetts. Mt. Holyoke students can receive credit through Amherst College but receive lesson funding from their own institution. A basic proficiency on the instrument is a pre-requisite for credit and there is a performance requirement. If you’re a Five-College student and aren’t interested in credit, I can teach you privately. Either way, I ask college students to attend local contradances often. That’s where they find the grooves! We separate the practical (and practicable!) skills, learning tune patterns with the left hand and rhythm grooves with the right. Then, combining hands, we use postural awareness to build tension-free and efficient playing techniques – key to future success in learning. Students like my holistic approach. I sneak theory in painlessly, a tune at a time. Learn ten tune progressions in any key and you’ve explored most chord possibilities for that key. What seemed terrifyingly mysterious before becomes familiar and you grow mightier as a musician with every tune you learn! 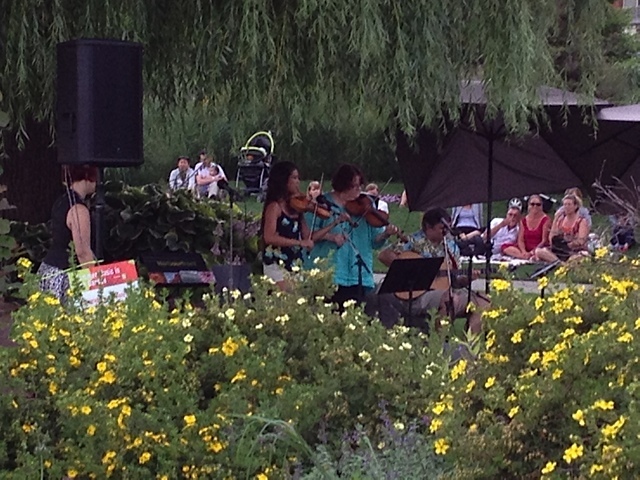 Lia Hanes-Stetter performs with Mist Covered Mountains trio at the Toronto Harbourfront Garden’s summer concert series. I use Skype online. Distance learning best suits players who have some skills already. A brand new player needs a ‘hands-on’ teacher to help them secure a reliable bow and instrument hold. The tech piece is not difficult. Download Skype and pick a user name. I’m “donnafiddler.” The slight time delay makes playing together difficult, but that hasn’t stopped any of my students from improving their skills. Bearing these technical limits in mind, this is an effective way to learn. Fiddlers really are a world-wide community. 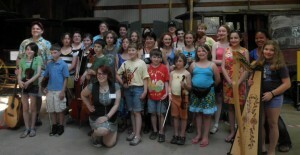 Check out the Facebook Fiddlers’ Association. Some friends and I founded it about fifteen years ago and it’s going strong with more than 5,000 fiddlers! Students from the U.S., Canada, Australia, the Caribbean, Central America and Europe have worked online with me. With some it’s as little as one or two lessons but with others like Lia, it’s been seven years! Finding a mutually awake time with my Aussie student was tricky but we didn’t let that stop us. I use my iPhone to record tunes as I play them during the lesson and email them before we’re done. Send me an email outlining your skills, goals and interests. Include an mp3 of your playing if you like. Don’t be shy. I’ll listen and make notes with questions for you. I answer your email and we test the online connection, setting a lesson time. Lessons are available Mon.-Fri., 10 am – 7 pm U.S. Eastern standard time, with occasional weekend times available. We schedule lesson time/s, I bill you and you pay online through PayPal or by check, if you live in the U.S. I also offer a 15% discount for pre-paid ten-lesson learning blocks. Contact me for costs. During the lesson, you can present tunes or other agenda items – anything you want to learn. I watch and listen to you play and offer suggestions. I teach bowings and rhythms or break down a tune, phrase by phrase, recording it to send you. I record other new tunes and/or practice aids and exercises on my iPhone and email them to you before the lesson is over. If you read music, I also email you transcriptions for any new tunes. You’ll want the chord chart even if you don’t need or read the music. A webcam (internal or external) and a high speed connection. DSL can be tricky; a broadband connection is best. We test the connection before I bill you so we know everything works. Contact me to discuss your learning agenda today! Fiddling Demystified’s left and right-hand focus on learning regional playing styles uses ear-training to mine tunes for their finer points. For sight-readers, this method fills in the style details for each tune, breaking down right hand bowing licks and left hand ornaments into manageable lessons for teachers and students. There are rhythm and style motifs for each tune, setting each one authentically in its native ‘dialect’. Fiddling with a French Accent – Learn the driven-bow syncopation that characterizes French-Canadian and Franco-American fiddling, along with the crooked tunes (l’airs tordus), cross/open tunings, podorhythmie or seated foot-tapping, turlutter (lilting the tune with the voice) and the joyful repertoire and rhythms of my Franco fiddling mentors, Louis Beaudoin and Gerry Robichaud.